In the 1400s, the mariner's astrolabe was developed as the replacement for planispheric astrolabes used at sea and saw continued use until the 1700s. It was a brass disk that was marked in degrees and had a spinning alidade. The distinctive large holes in the disk were to reduce its movement in light winds. 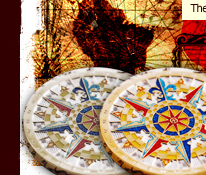 It was designed to have a much simpler function and did not contain several moving disks which the planispheric astrolabe had that were difficult to utilize on a tossing ship. 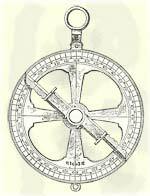 Even though the mariner's astrolabe never fully replaced the quadrant (the quadrant was much too versatile) one of its biggest benefits is that you did not have to look directly at the sun to take a measurement like was needed with cross staffs and some quadrants. 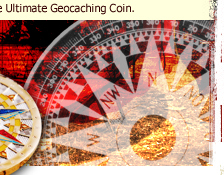 The image of the navigator on the front of the Mariner's Astrolabe Geocoin™ shows how this tool was used when taking a reading from the sun. 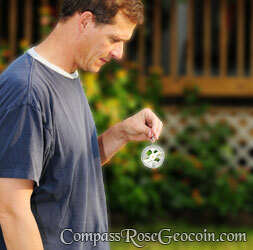 We also incorporated a raised metal edge around the coin. A real antique mariner's astrolabe would not have this raised edge, but we thought it was important to provide some protection to the spinning alidade. Instead of attaching a large metal ring for the handle, which were typical of old style astrolabes, we attached a rotating clip to make it easier for hooking the astrolabe to a stable item such as a post when taking a reading. The two holes on the spinning alidade are small enough to get a fairly precise reading from sunlight, but are large enough to see through when taking a reading of the North Star, Polaris. 1. 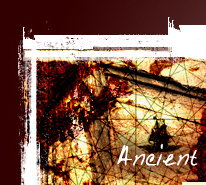 Grasping the ring, hold the astrolabe up in the air towards the North Star. 2. 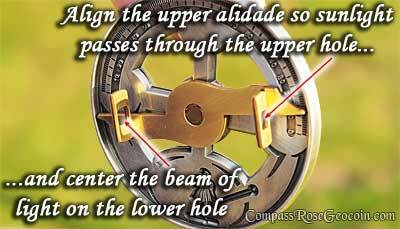 Line up the holes in the spinning alidade so that you can see Polaris through them. 3. 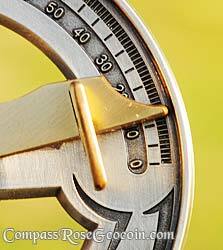 Take the reading from the degree scale and you now have your latitude. 1. Grasping the top ring, hold the astrolabe to about chest high. 2. Looking down on the alidade, let the sun shine directly though the upper alidade hole. 3. 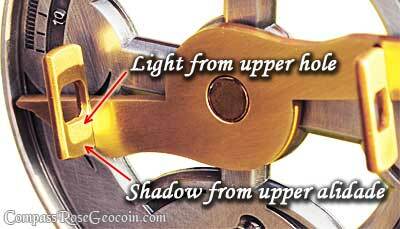 Adjust the alidade so that the beam of sunlight shinning through the upper hole passes through the lower hole. The picture below shows how the light and shadow from the upper alidade look when slightly misaligned with the lower alidade hole. 4. 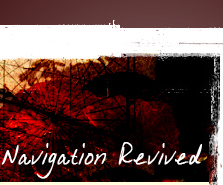 Now you can take a reading from the degree scale and see the declination of the sun. In this example, the degree scale shows the sun is at 11 degrees. These example photographs show the angle of the sun during the evening to give better contrast of the sunlight passing though the hole. 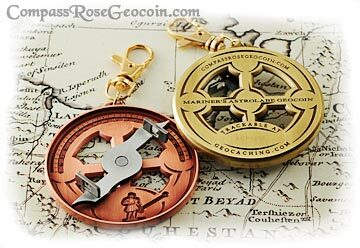 When using the Mariner's Astrolabe Geocoin� for navigation, you will want to take a reading at high noon. *Warning* Never look directly at the sun. Sighting the sun directly into your eye can cause blindness.